. :: The Perils Of Show Jumping Sport - 1 ::. Well for anyone who thinks being a top international show jumper is all glamour, jet setting and parties, I’m sorry to burst that bubble! Although on most days we have the most fantastic job in the world - and getting to meet new people, see cool countries and sometimes get to travel into show behind police outriders does happen...however, on a normal basis our day involves packing, unpacking, paperwork and budget airlines!!! 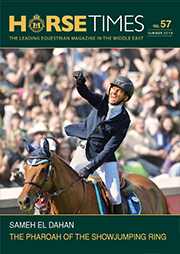 In one month we have gone from the high of Sameh El Dahan being third in the Rolex Grand Prix at Spruce Meadows, complete with press conferences, to this week getting two lorry loads of our youngsters and horses that were left behind while we were at Spruce to a national show in England. It was hot, dusty and lots and lots of bugs!!! One lorry arrived back last night with some of the novices who won’t go to Holland and now today is quick turnaround - repack lorry with more feed, haulage and shavings - plus of course the three fresh horses - then off they go to get the ferry this afternoon - phew! !